Have you ever developed an itchy rash on your scalp, neck or face after using a conditioner? Hair conditioners are just one of the many types of skin care products used by many on a daily basis. We use conditioner after shampooing at home, at the hair salon as well as a treatment when our hair is feeling dry and brittle. Ever notice the ingredients that go into hair conditioners? Before my lifestyle change towards reducing chemical exposures, I typically purchased my hair care products from the local pharmacy, like Rite Aid, Duane Reade or even from a big box store like BJs. I certainly never read ingredient labels because I never thought I needed to. 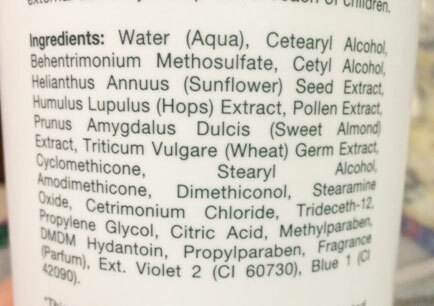 This is an ingredients label from a brand I used to use. In addition to a few of the above ingredients, you can also see water, some natural extracts as well as additional ingredients like behentrimonium methosulfate (hair conditioning agent/ surfactant/ antimicrobial), cyclomethicone (emollient/ hair conditioning agent) and preservatives, DMDM Hydantoin, Methyl and Propylparabens. These are some of the ingredients one can find in hair conditioners and which are also common allergens. What if you are allergic to parabens or propylene glycol. Or DMDM Hydantoin. Or fragrance. In today’s post, I want to offer a few alternatives for those with allergies to some of the ingredients found in conditioners. If you suffer from more than one ingredient sensitivity, you may want to purchase products with just a few basic ingredients and nothing more. Not only is this lifestyle switch good for those with ingredient sensitivities, it’s also ideal for those looking to decrease their exposure to chemicals overall. It is always recommended to perform a patch test prior to using a product. Always read ingredients lists and contact the manufacturer if you have a known allergy to a specific ingredient to ensure the ingredient isn’t included in the product you wish to use. If a product lists an ingredient you have a sensitivity to, it is best not to use that product. If you develop a contact allergy to your conditioner, you should immediately discontinue using it and call your doctor or dermatologist. Using ingredients like Organic Lemon Juice, Organic Shikakai Powder, Organic Coconut, Olive, Hemp, Jojoba, Lemon and Orange Oil, this gentle, synthetic free conditioning rinse nourishes and moisturizes hair. This antioxidant filled hair treatment oil using Organic jojoba, pomegranate, rosehip and sea-buckthorn oils help to nourish and replenish dry hair. 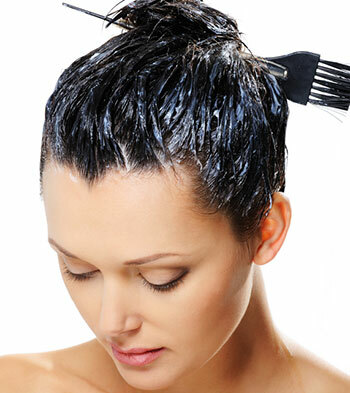 It's easy to use, apply hair oil to dry, clean hair, massage and allow to soak in for at least one hour. Badger Sea-Buckthorn Hair Oil is USDA certified organic and contains no synthetic chemicals. Fragrance Free Hair conditioner from Nurture My Body contains 16 certified organic botanicals to help soften and place the moisture back in your hair. This is a good choice for those suffering from chemical sensitivities or simply for those wanting to reduce their own body burden. See the list below as to what each Nurture My Body product is free from. They do have another hair conditioner not labelled fragrance free as it does include some essential oils for added fragrance. Caution, as it does contain many botanical extracts, this wouldnt be good for those with flower allergies or those sensitive to plant ingredients, so always read your labels. This product has gotten raves from many people including myself. It isn't completely chemical free however, it is the perfect conditioner for people who have very specific allergies to parabens, fragrance, lanolin, dyes, preservatives and formaldehyde releasers. If you suffer with any of these ingredient allergies, you know it can be quite challenging to find products that do not contain them. Here's the complement to Naturoli's Soapberry Shampoo, their moisturizing conditioner with soap berry powder. I love how this product is completely free of parabens, artificial fragrances, formaldehydes, sulfates, or detergents. Along with Aloe Vera Extract, Botanical Glycerin, Jojoba, Organic Olive Oil and botanical extracts, this conditioner helps to hydrate hair making it more manageable and tangle free. This simple recipe only requires 3 ingredients, organic coconut oil, pumpkin seed butter and Aloe Vera Gel. No chemicals, and all natural. What conditioner product do you use for your sensitivities?